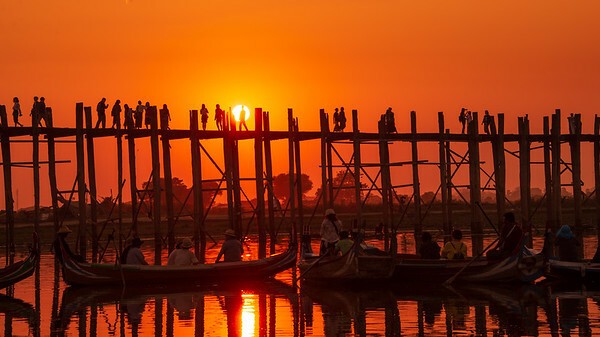 While deciding whether to embark on an adventure to Myanmar (former Burma) in SE Asia we read of calls for a tourist boycott because of the ongoing conflict and atrocities affecting thousands of Rohingya Muslims fleeing persecution by the Burmese military. We read and learned as much as we could about the backstory and the ethical questions before making a final decison. The epic journey would involve a flying time of more than 50 hours, encompassing 5 different international flights, 2 national flights, touching down in 4 different countries on a middle eastern airline (Qatar Airways). Was the toil worth it for 9 days spent in a country halfway around the globe? This undertaking would involve taking vaccines and gulping down Malaria prophylaxis pills daily. Our son had traveled there 8 years prior and he certified it as one of his favorites; so that sealed the deal. We were booked. I guess so to our moms. We love you very much but have to keep going and get it all in. Lots more to see!! We were rewarded for our efforts in so many ways. The trip was transformative. That happens with travel. I am sure that is the draw that keeps the travel machine humming along. 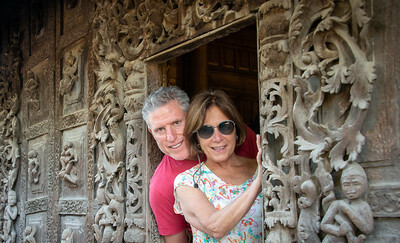 Once we finally set foot in Myanmar, all our fears and apprehensions quickly faded away. No big surprise. We humans, are all different but also the same. Anywhere on the planet. Different flavors of humans, doing human things, each with their own local flare and twist. Foreign yet very familiar. Relax and get into the travel rhythm. It is easy to savor and enjoy. 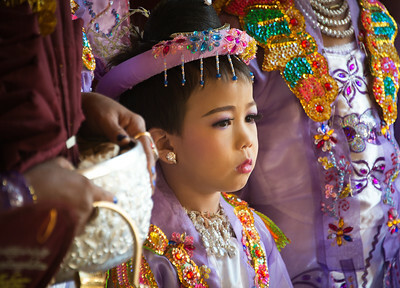 The Burmese are gentle, accepting, and very religious souls who seem at peace with themselves despite the turmoil around them. 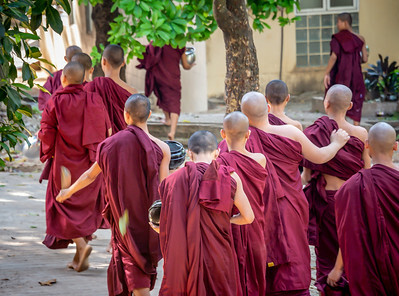 It is the most world's most religious Buddhist country in terms of the proportion of monks in the population and proportion of income spent on religion. There are one-zillion temples in all shapes and sizes. 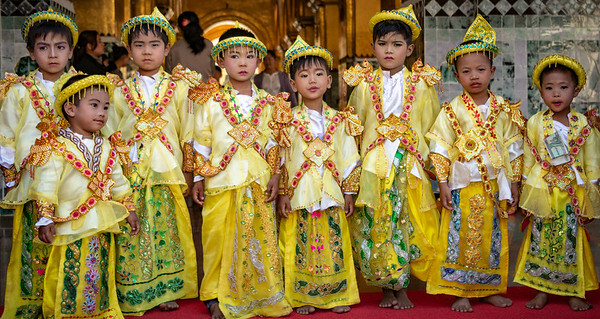 The selfless natives are spending their first and last Kyat (Burmese dollars) plastering their buddhas with 24 karat gold sheets in a show of devotion. They donate food and supplies to the revered Monks who have left their families as they grow older to meditate and practice religion in earnest and in isolation. 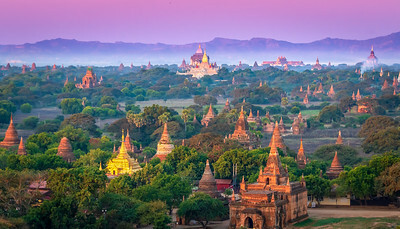 Merit-making is the most common path undertaken by Burmese Buddhists. This path involves the accumulation of good merit through charity and good deeds to obtain a favorable rebirth. In other words, do the right thing to get extra positive super-duper karma and a good lot on your next time around on the planet. Makes sense. We spent our days with knowledgeable caring guides. 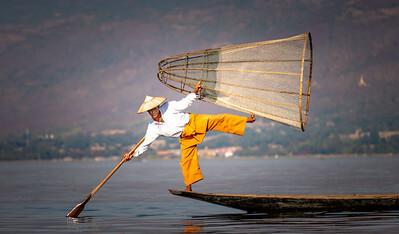 We hit the major 4 areas for first-time visitors including Yangon (Shwedagon pagoda), Inle Lake (stilt-house villages & floating gardens), Bagan (Temple town. 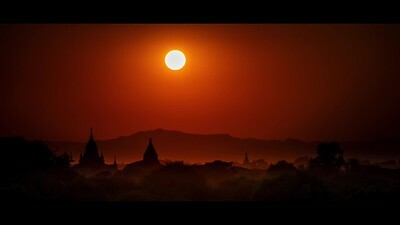 Balloons over Bagan), and Mandalay (Mandalay Hill, Jade Market). We questioned each of our guides about the politics and the atrocities. It naturally turns out to be very complicated without any easy solution. But each guide was optimistic in their own way that better times were ahead. In addition to seeing religious sites, we visited villages who rarely see westerners. We had an amazing, spontaneous, freewheeling time at a village middle school teaching English, reciting rhymes, doing Origami and playing pied piper while leading a hundred children in calisthenics in the school’s courtyard. The kids were wild. We felt sorry for the teachers and the school principal when we finally departed. We had the privilege of touring a medical clinic for those in need where the natives traveled hundreds of miles for care doled out by caring docs who donated their services and supplies. It was heartwarming and heartbreaking at the same moment. We met a people who are at the crossroads. Their infrastructure is improving and the future somehow seems bright despite the immediate problems and an insidious oppressive military government. We never felt unsafe and conversely, we always felt we cared for and taken care of at all times. There was a unifying vision that stuck with us as we were ready to depart. Despite being Westerners speaking a different language with different customs we were always accepted by everyone during our time in this wonderful country. After just a brief moment of eye contact, this amazing smile would blossom across the faces of the Burmese. You couldn’t help but know you were accepted and welcomed by another on our amazing planet. No more doubts or fears just people being together. Just show up. No tourist boycott for us. Anyone for World Peace?